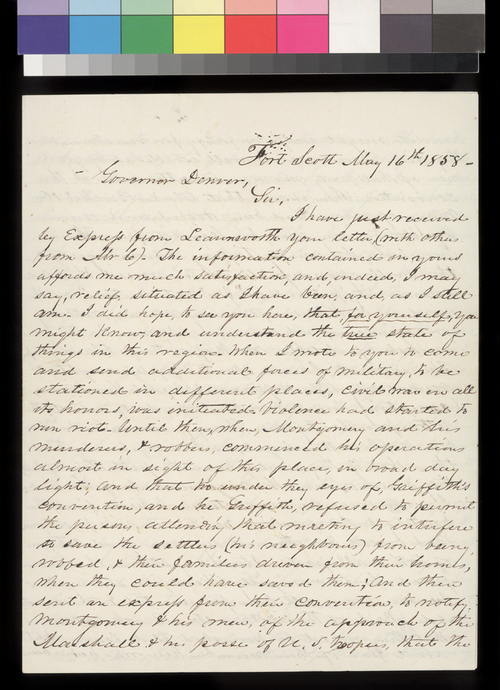 Williams, writing from Fort Scott, Kansas Territory, to Governor James W. Denver, complains about the activities of James Montgomery and "his murderers & robbers" in Bourbon County. Williams, who displayed moderate views, condemns both proslavery and free state violence and maintains that the citizens of Bourbon County simply wanted to live in peace. Collections - Manuscript - Denver, James W.